Fabric pop-ups available in multiple sizes. Gamma provides the Expandable fabric display, which suspends a durable fabric image that can remain attached to the frame when collapsed. Attached with velcro, fabric displays are available as straight walls or curved fabric display stands. Gamma’s dye sublimation printing provides a fabric pop-up with a rich color spectrum and excellent image quality. 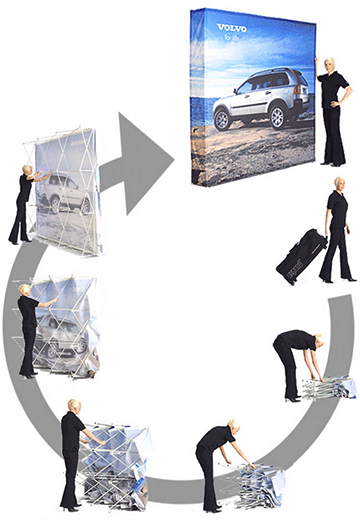 Expandable pop-ups are offered as 8 foot or 10 foot straight walls, curved fabric display stands, or table top displays.